Recently, I met an old friend for brunch at Wolf Peach at 1818 North Hubbard (the old Roots). I was really excited to try their Bloody Mary as it’s been recommended to me a few times. We set 10AM for our date, right when they open. When I walked in at 10AM, it wasn’t too crowded but a nice noise level and atmosphere. I’ve never been there before and was really impressed with the view and sunlight coming in. It was so cozy. They asked if I had reservations but it didn’t get too crowded while we were there making me think reservations aren’t necessary. My meal helped cozy me up too. Since Beta on Water Street closed, TJ and I have been on a quest for a matching chicken and waffles dish. I think Beta’s dish is a legacy now, and no one will reach just how good it was… like an exaggerated story, the tastiness of the dish keeps growing and growing. However, Wolf Peach’s version was prettay, pretty… prettay good. Mix: In one word, I thought this Bloody Mary was ‘good’. It wasn’t anything I’d write home about but it was good. It was well-flavored – I tasted celery salt in particular which I am a big fan of. There was other seasoning in there, of course, but I couldn’t put my finger on particular ones. The downside to this Bloody was that it was a bit watered down and went down very quickly. Garnish: This Bloody Mary was perfectly accompanied by a small beef stick, a large block of herbed cheddar cheese, small mushroom and large green olive. Chaser: Came with a little shorty of Rhinelander which… you know… is so tasty. Buzz: Taken down with Chicken & Waffles, sadly, no buzz factor was going down at the Wolf Peach. Cost: I think this was only $6! My #1 take-away from this quest I’m on is… everyones taste is so different. So many people tell me they liked (this establishment) or (this establishment), and I just didn’t care for them. I like Bloody Mary’s thick, full of flavor and a kick of spice. 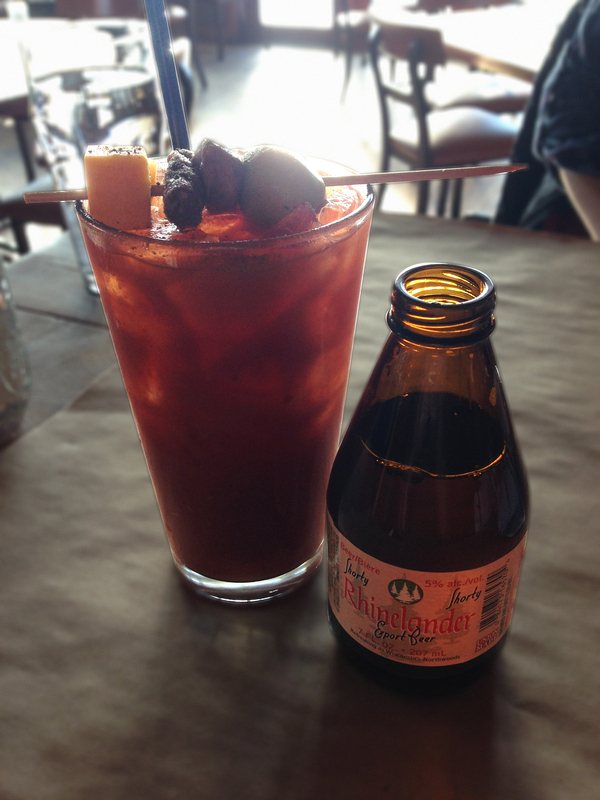 Unfortunately, Wolf Peach wasn’t my favorite but I’d certainly recommend it to all Bloody Mary lovers when you check this place out for brunch…. especially for the price. First. love you column and reading where you go and what you think of their bloodies. Second, you mentioned chicken and waffles so I had to share. Last week had brunch at Cafe Perrin on Vliet and both their chicken and waffles and their bloody were fantastic! Thanks Carrie! I will be adding Cafe Perrin to the list… right now. Can’t get enough of the chicken/waffle quest! This entry was posted on January 31, 2014 by Shannon in Bloody Marys in the area and tagged Bloody Mary, Milwaukee, restaurants, Wolf Peach.